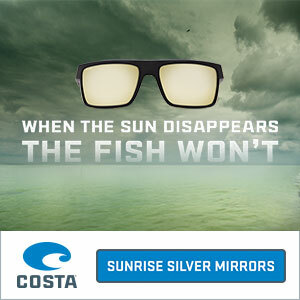 Question- How do I choose Polarized Sunglasses? "What is the best type of lenses for the different water (i.e. Ocean, gulf, rivers, Indian River Lagoon system). Thanks for your question, Dave. This is another very common question so I will answer it here on the blog in hopes that others can benefit as well. There are specialty lenses for each, but I cant really be changing glasses every time the conditions change. I first look for a company that stand behind their products and offers both the lenses I like and enough frame styles so that I can find what is comfortable for me. Costa has been very good to me and has stood behind every product, and they also are funding a permit tagging study which is a really big deal to me. The permit is my favorite fish and the fact that Costa is concerned about their survival and doing something to make sure they thrive is enough to make me a Costa customer for life. I like a lens that is copper or amber based for every day fishing. Different shades of mirror can be put on lenses to change the look, but I like to start with a copper. Most of my fishing is inshore and I feel that this lens color is the best and most comfortable for me. I suggest going to a Bass Pro Shops, where they have tons of frame choices and you can actually try on one after another and really find out which fits you best. Then go with your lens color choice. The last choice is plastic or glass. Ask around and you will find people that are passionate about one or the other. Personally, I am a plastic lens guy. I have been hit in the face with jigs, flies, lures and rod tips. When I go fishing, I do not take off my glasses. The first rule I made for my kids was that they HAD to wear sunglasses at all times while fishing. I have just seen potential eye injury way too many times, really, on a daily basis. I choose plastic because I feel that they protect my eyes better than glass but this is only my opinion. Costa's plastic lens is called the 580P and I highly recommend it. Here is a Tips From the Pros video we did on this same topic. Newer PostQuestion-Bahia Honda Rig For Tarpon? Older PostPermit Guides in Key West?